Concrete admixtures (additives) enhances the properties of concrete for applications in construction with special requirements. Concrete additives are used to achieve desired workability in case of low water cement ratio, and to enhance setting time of concrete for long distance transportation of concrete. So, it is of much importance for a civil site engineer to know about the types of admixtures (additives) and their properties for better selection and application in concrete works. As per BIS (IS – 9103: 1999) Page No.1, Concrete Admixture is defined as a material other than water, aggregates and hydraulic cement and additives like Pozzolana or slag and fiber reinforcement, used as on ingredient of concrete or mortar and added to the batch immediately before or during its mixing to modify one or more of the properties of concrete in the plastic or hardened state. 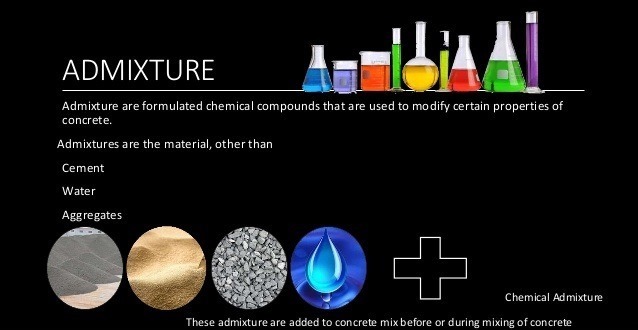 Admixtures are used to modify the properties of concrete or mortar to make them more suitable for the work at hand or for economy or for such other purposes as saving energy. Increase workability without increasing water content or decrease water content at the same workability. Retard or accelerate time of initial setting. Modify the rate or capacity for bleedings. Reduce the rate of slump loss. Retard or reduce heat evaluation during early hardening. Accelerate the rate of strength development at early ages. Increase strength (compressive, tensile or flexural). Increase durability or resistance to severe condition of exposure. Control expansion caused by the reaction of alkalies with certain aggregate constituents. Increase bond of concrete to steel reinforcement. Increase bond between existing and new concrete. Improve impact resistance and abrasion resistance. Inhibit corrosion of embedded metal. When properties cannot be made by varying the composition of basic material. To produce desired effects more economically. Unlikely to make a poor concrete better. Not a substitute for good concrete practice. How to Use Concrete Admixtures? Never use one from an unmarked container. Keep containers closed to avoid accidental contamination. Classification of admixtures according to the book of “Concrete Admixtures: Use and Applications” edited by M. R. Rixom are given in the forward pages. These are generally used to improve workability, ease of placing, increased durability, better resistance to frost action and reduction in bleeding. The common Air-Entraining agents are natural wood resins, neutralized vinsol resins, polyethylene oxide polymers and sulfonated compounds. These are anionic, because the hydrocarbon structures contain negatively charged hydrophilic groups, such as COO, SO3 and OSO so that large anions are released in water. Conversely, if the hydrocarbon ion is positively charged, the compound is cation active or cationic. In other words, anionic surface active agents produce bubbles that are negatively charged, cationic charged cause bubbles to be positively charged, surface active agents of all classes can cause air entrainment in concrete, but their efficiency and characteristics of air-void system vary widely. These are foaming agents, gas producing chemicals. It introduces millions of tiny, stable bubbles of uniform size that are uniformly distributed throughout the mix (usually about 5% of the volume). Improves properties of fresh concrete such as workability, cohesion and reduces segregation and bleeding. Improves properties of hardened concrete – For every 1% of air there is a 4% loss in strength which is minimized by the reduction in water content. It improves durability of hardened concrete. Accelerating admixtures are used for quicker setting times of concrete. It provides higher early strength development in freshly cast concrete. The principal role on mechanism of water reductions and set retardation of admixtures are usually composed of long-chain organic molecules and that are hydrophobic (not wetting) at one end and hydrophilic (readily wet) at the other. Such molecules tend to become concentrated and form a film at the interface between two immiscible phases such as cement and water, and alter the physio-chemical forces acting at this interface. The mechanism by which water reducing admixture operate is to deflocculated or to disperse the cement agglomerates into primary particles or atleast into much smaller fragments. This deflocculating is believing to be a physio chemical effect whereby the admixture is first of all adsorbed on to the surface of the hydrating cement, forming a hydration “sheath”, reduces the antiparticle separated from one another. a reduction of the interfacial tension. protection sheath of water dipoles around each particle i.e. mobility of fresh mix becomes greater, partly because of reduction in inter-particle forces and partly because of water freed from the restraining influence of the highly flocculated system which is now available to lubricate the mixture. Hence less water is required to achieve given consistency. Why Water Reducing Admixtures are used? c) While maintaining the same w/c ratio and workability concrete can be made to a given strength as in the reference concrete at lower cement content. The straight addition of admixtures of this type does not came any increase in permeability and indeed where the admixture is used to reduce the w/c, then permeability is considerably reduced. Admixture of this type when used as workability aids on water reducers do not adversely effect the shrinkage. Materials of this type of admixture have no deleterious effect on the creep of concrete. a) While using water reducing agent. Care must be taken in controlling the air content in the mix. 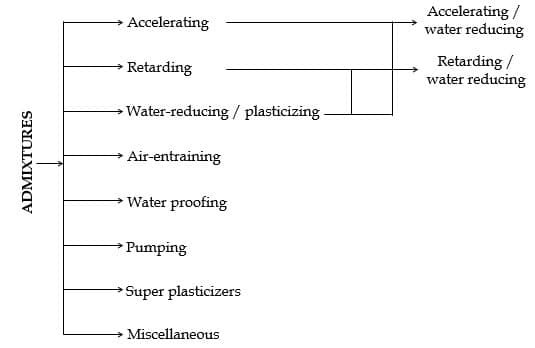 Most water-reducing agent entrain air due to their surfactant properties. b) At high dosages of lignosulphonate material, retardation of the mix occurs. a) When concrete pours are restricted due to either congested reinforcement or this sections. b) When harsh mixes are experienced such as those produced with aggregates (crushed). Then considerable improvement in the plastic properties of concrete can be obtained. c) When required strengths are difficult to obtain within specified maximum cement content and where early lifting strengths are required. d) By addition of this admixture in concrete cement economics of about 10% can be obtained. The function of retarding concrete admixture is to delay or extend the setting time of cement paste in concrete. These are helpful for concrete that has to be transported to long distance in transit mixers and helpful in placing the concrete at high temperatures, specially used as grouting admixture and water reducers results in increase of strength and durability. a) Unrefined lignosulphonates containing sugar, which of course the component responsible for retardation. It is thought that retarding admixtures are absorbed on to the C3A phase in cement forming a film around the cement grains and presenting or reducing the reaction with water. After a while thus film breaks down and normal hydration proceeds. This a simple mixture and there is a reason to believe that retards also interact with C3S since retardation can be extended to a period of many days. Why Retarding Concrete Admixtures are used? To delay in the setting time of concrete without adversely effecting the subsequent strength development. a) The hydroxyl carboxylic acid type admixture normally produces concrete having a slightly lower aim content them that of a control mix. b) Materials of this class (lignosulphonate containing sugar and derivatives of hydroxyl carboxylic acid) in some cases have a much higher dispersing effect and hence water reducing capacity. a) When lignosulphonate based material used, then the air content might be 0.2 to 0.3% higher unless materials of the tributyle phosphate type are added. b) As the water content increases, so there is a tendency for drying shrinkage. a) Where long transportation of ready mixed concrete is required then premature setting can be usefully avoided by this type admixture. b) When concrete is being placed or transported under conditions of high ambient temperature. These are the second generation admixture and also called as Superplasticizers. These are synthetic chemical products made from organic sulphonates of type RSO3, where R is complex organic group of higher molecular weight produced under carefully controlled condition. a) formaldehyde derivatives such as melamine formaldehyde and napthalene sulphonate formaldehyde. This admixture acts as the same way as that of a water reducing admixture acts. It disperses the cement agglomerates when cement is suspended in water and adsorbed on to the surface of cement, causing them mutually repulsive as a result of the anionic nature of super plasticizers. Why Super Plasticizer Admixtures are used? a) At a given w/c ratio, this admixture increases the workability, typically by raising the slump from 75 mm to 200 mm. b) The second use of this admixtures is in the production of concrete of normal workability but with an extreme high strength (super plasticizer can reduce the water content for a given workability by 25 – 35 percent compared with half that value in the case of conventional water reducing admixtures). a) The concrete using this admixture can be placed with little or no compaction and is not subject to excessive bleeding or segregation. b) They can be used as high dosages became they do not markedly change the surface tension of water. c) It does not significantly affect the setting of concrete except that when used the cements having a very low C3A content. d) They do not influence shrinkage, creep modulus of elasticity or resistance to freeing to thawing. The only real disadvantage of superplasticizer is their relatively high cost. a) In very heavily reinforced sections, in inaccessible areas in floor or road slabs. b) Where very rapid placing is desired. Mineral admixtures are finely divided materials which are added to the concrete in relatively large amounts, usually of the order of 20 to 100 percent by weight of Portland cement. a) In recent years’ considerable efforts have been made by the cement industry world wide to reduce energy consumption in the manufacture of Portland cement. Therefore, a partial replacement of Portland cement by mineral admixtures which can be of the order of 50 – 60% by weight of total cementitious material, represents considerable energy savings. b) The ability of cement and concrete industries to consume mithions of tons of industrial byproducts containing toxic metal would qualify these industries to be classified as environmentally friendly. c) Since natural Pozzolana and industrial by products are generally available substantially lower costs than Portland cement, the exploitation of the Pozzolanic and cementitious properties of mineral admixtures are used as a partial replacement of cement can lead to a considerable economic benefit. d) Possible technological benefits from the use of mineral admixtures in concrete include entrancement of impermeability and chemical durability, improved resistance to thermal cracking and increase in ultimate strength. a) Pozzolanic — Siliceon or siliceons and admixtures material which itself possesses little or no cementitious value but is the presence of moisture chemically react with CalOH2 at ordinary temperature to form compounds possessing cementitious properties. b) Pozzolanic & Cementitious — The materials which have some cementitious properties in itself. ASIM specification C618 recognizes the following three classes of mineral admixtures. a) Class N — Raw or calcined natural pozzolanic such as diatomaceous earths, clay and shales, tuffs and volcanic ashes. b) Class F — Fly ash produced from burning anthracite or bituminous coal. c) Class C — Ash normally produced from lignite or sub-bituminous coal which may contain analytical CaO higher than 10%. Although the use of silica fume (SF) in concrete has increased significantly in the past few years, its beneficial properties were not well realized until comprehensive research was undertaken in the late 70’s and early 80’s at the Norwegian Ins. of technology to study the influence of SF on concrete properties. Silicon, ferrosilicon or other alloys are produced in so-called “submerged are electric furnaces”. There are two types of electric furnaces one is with heat recovery system and the other is without heat recovery system. The specific gravity of SF is generally equal to that of amorphous silica which is about 2.20. However, depending on its chemical composition, the specific gravity of SF particle can be as high as 2.40 and 2.55, as in the case of FeGSi. The specific surface area of SF is measured by nitrogen absorption is given below. c) SF is composed mostly of fine spheres with a mean diameter of 0.1 to 0.2 mm. The unique characteristics of SF that make it suitable for use as supplementary cementitious materials are its fineness, highly amorphous in nature and elevated content of SiO2. The small SF spheres act as fillers since they occupy some of the space between the relatively coarser cement grains which can be otherwise occupied by water. This results also in a denser matrix with a better gradation of fine particles. Bache stated that in a super plasticized, low w/c ratio concrete, small SF spheres can displace water entrapped between the flocculated cement grains, thus increasing the amount of free water in the paste which enhances fluidity. Several researchers have studied the pozzolanic properties of SF. The resulting reactions between SF and Ca(OH)2 increases the volume of CSH and reduces the total volume of capillary pores in the cement paste. The pozzolanic reactions of SF with Ca(OH)2 reduces the amount of Portlandite in the hydrate cement paste. Mehta explained that the absence of large Portlandite crystals in a SF mixture can be due to the fact that each SF particles can act as a “nucleation site” for precipitation of Ca(OH)2. As a result, numerous small crystals of Ca(OH)2 can form rather than a few large ones. This absence of large and week crystals of Portlandite enhance the mechanical properties of concrete. The beneficial action of SF has also been attributed to the reduction of the porosity of the transition zone between the cement paste and aggregate which increases the strength and impermeability of the concrete. In or conventional concrete, the transition zone can have large and oriented Portlandite crystals which form weak zones in the concrete. The thickness of the transition zone can be drastically produced by adding SF to the concrete since SF reduces bleeding and the amount of water accumulation under aggregate. As a result, it decreases the porosity of the transition zone and it also reduces the concentration of oriented Ca(OH)2 crystals. Concrete admixtures shall be selected carefully as per the specifications and shall be used as recommended by the manufacturer or by lab testing report. The quantity of admixtures to be used for specific application of admixtures are recommended by the manufacturers. For use in large construction projects, the quantity of the admixture to be used shall be obtained from tests reports for concrete mixed with admixtures at various percentage admixtures use. These tests are conducted to understand the behaviour of admixtures on the desired quality and strength of concrete at different quantity of admixtures used. Thus, the optimum quantity of admixtures can be selected for specific application based on results. The selection of specific admixtures for use in concrete to alter properties of concrete should be selected carefully as per requirement of concrete works. Concrete admixtures should be used judiciously according to specification and method of application to avoid adverse effect on concrete properties at fresh and hardened state. After selecting the admixtures product, one should carefully choose the supplier with quality product, timely service and at competitive price. The admixture supplier should be with good history and should possess the staff with efficient and professional experience to guide on effective application/use of admixture in right way. Concrete admixtures should be accepted with test certificate, manufacturing date and its chemical composition, should comply specifications given by the authorities.